While men are becoming more open in their discussion of hair loss and treatments, hair loss solutions for women are not as common, and many continue to suffer in silence. It is essential for women to understand that they are not alone. 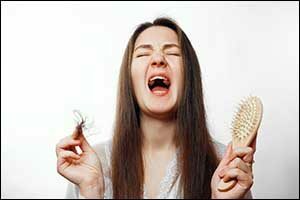 Excessive hair loss in women affects over 30 million women in the United States. There are many causes of hair loss, which can range from genetics to hormones and could even be the result of prescription medications, supplements, chemicals, and complications due to illness. The sooner you can identify the cause, the easier it will be to find solutions for women and hair loss that will work. On average the typical women loses between 50-250 strands of hair each day. The variation accounts for the difference that can be seen on days when hair is washed, if hair gets tangled in a ponytail band, if you wear a hat, or if your scalp is dry or damaged. Taking care of your hair and scalp while maintaining healthy hair habits can help, but sometimes there are other reasons why hair loss could increase. Start by ruling out any prescription medications or supplements that you might be taking. Your physician can tell you if you have an illness or disease that is impacting hair loss. However, excessive hair loss in women can be treated with a visit to South Coast Hair Solutions in New Bedford. Regardless of the cause, there is a solution. Our Corrective Hair Solutions (CHS) approach has everything from Virtuesse hair replacement treatments to our popular Southeastern Massachusetts laser therapy for hair. Depending on your needs, budget, lifestyle and the underlying cause of hair loss, we can help match you with the solution that is right for you. Even if you have been suffering from hair loss for years, our team of highly trained and skilled technicians can help provide you with guaranteed hair loss solutions for women. Even if you have been told that you have permanent hair loss, we have non-surgical options that can help you to have the hair you have always wanted so you can look and feel like yourself again. What is Corrective Hair Solutions? Our approach is different because every solution that we provide is designed to meet your individual needs. Some types of hair loss are hereditary, while others are due to medical, environmental, stress, chemical, and other underlying issues. We offer an individualized approach because the needs of a client who is experiencing patchy hair loss all over the scalp will be significantly different than a client who has thinning hair at the crown. We focus on you and your needs, including your lifestyle and budget restrictions, to create a solution that will be best for you. Corrective Hair Solutions are safe and natural, affordable, and will not restrict your active lifestyle. They are designed specifically for women – not some hand-me-down solution that was created for men. Our treatments are individualized to your specific needs and will work with your existing hair, solving all hair loss problems to help you look your best. Most of all, when you come to South Coast Hair Options, you will receive treatment options that are totally natural looking. Restore your confidence today with our professional hair loss solutions for women. 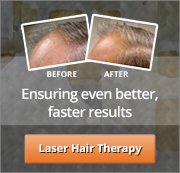 What is Laser Therapy for Hair? You might have heard about laser therapy treatments used throughout the medical industry. The use of low level laser therapy or photo-biotherapy, is used to increase healing and to stimulate cell metabolism for damaged cells. These photo-biochemical changes can only be achieved if they receive the correct amount of light energy. As a result, the “laser treatment” products available through as-seen-on-TV outlets or big box stores cannot possibly duplicate the success that our clients experience with our Southeastern Massachusetts laser therapy for hair. If you are a candidate, based on your unique type of hair loss, our technicians can apply this exciting therapy treatment at our New Bedford clinic. The treatment for women and hair loss is a much different dynamic than treating male pattern baldness or other typical types of hair loss experienced by most men. It is important to find a clinic that will address your specific issues and find a solution that is right for you. Like any other treatment option, what works for one, won’t necessarily work for all. That is why we customize the solutions that we offer to our clients to ensure the best possible results. If you are tired of dealing with issues surrounding excessive hair loss in women and would like to find out if you are a candidate for our Southeastern Massachusetts laser therapy for hair or any other Corrective Hair Solutions (CHS) treatment, visit South Coast Hair Options as soon as possible. Give us a call at 508-995-7085 or visit our clinic on Acushnet Avenue in New Bedford, Massachusetts.